Leisurely boat cruises of short duration are offered by various charter companies which operate from most of South Africa’s harbours in port cities, mainly those which also happen to be tourist attractions and destinations in their own right. 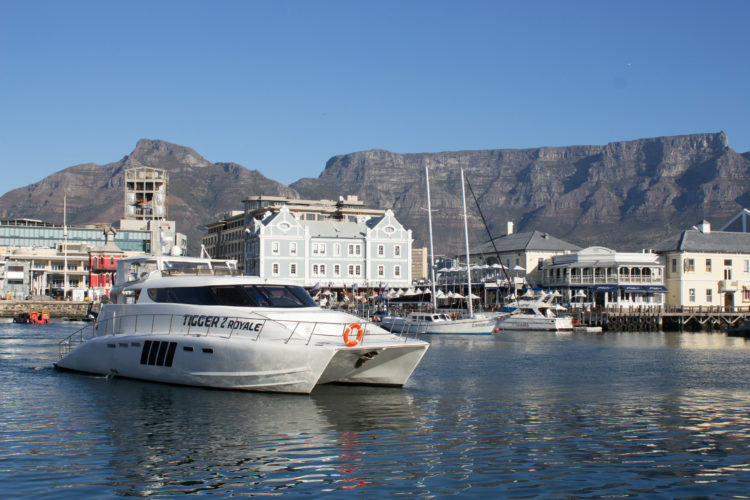 However, it would take a great deal to compete with Cape Town’s Table Bay and the V&A Waterfront, not to mention our Cape Town-based premier boat charter company, Tigger 2, which has been offering luxurious coastal cruises since 2008. Passengers, routes, and the duration of our cruises are entirely different. Our Tigger 2 charter vessel, the Tigger 2 Royale, is a luxurious, motorised boat, not a ship. Size is the most obvious difference between these two types of vessels – boats and ships. Tigger 2 Royale is a beautifully designed, opulently appointed 55-foot leisure cruise boat – a luxury catamaran, amply powered by two robust 530-hp inboard turbo-charged diesel engines, dramatically cutting down on audible engine noise and allowing passengers to focus on the sound of the sea and fun with their friends on board. Even at first glance, it quickly becomes apparent that the Tigger 2 Royale was designed with extraordinary attention to detail, finely crafted aesthetic qualities, and passengers’ lavish creature comforts in mind. All our state-of-the-art features are offset and emphasised by the boat’s gleaming white, streamlined exterior design lines, as well as the interior spaces, also in white, complementing the vessel’s overall appeal. Our boat’s top speed is 22 knots (44,7 km per hour). We typically cruise to and from Cape Town’s waterfront at about 12-16 knots (22-29,6 km per hour), moving fast enough to complete the cruise within the designated time, while allowing sufficient time to absorb and enjoy the scenery in a relaxed leisurely manner. The Tigger 2 Royale comfortably accommodates up to 65 passengers during a sunset and non-sit-down lunch or dinner cruise, or alternatively, up to 39 souls who book for a cruise that includes a seated buffet or plated meal. We cater for corporate groups, groups consisting of individual passengers, and special occasions, such as weddings, engagements, anniversary celebrations, birthdays, and couples who have romance in mind. Our outer decks consist of an open area with an overhead cover at the rear of the boat, plus a completely open sundeck on the bow. The luxurious, white interior consists of a fitted upper lounge in which to chill and chat, as well as a dining area, enabling guests to dine in comfort when they select a cruise that includes a delicious, freshly prepared meal. A spacious, comfy interior ensures that passengers are sheltered from inclement weather. Tigger 2 Royale’s upper lounge is equipped with DStv, a DVD player, a 42” plasma screen, and a PC connection. Comprehensive safety measures and precautions in line with South African Maritime Authority regulations. If you love Cape Town and wish to absorb its beauty from a different perspective, while enjoying outstanding, discreet, and personal service of world-class standards in the lap of luxury, our cruises should be on your bucket list.